Date: July 3, 2015 (Kathmandu) Syakar Trading Company (STC), the authorized distributor for Honda Motorcycles in Nepal, and one of the leading companies of Jyoti Group, have launched Honda’s well-loved scooter, Dio, in exciting new shades of Sports Red, Black, Candy Palm Green, and Candy Jazzy Blue. 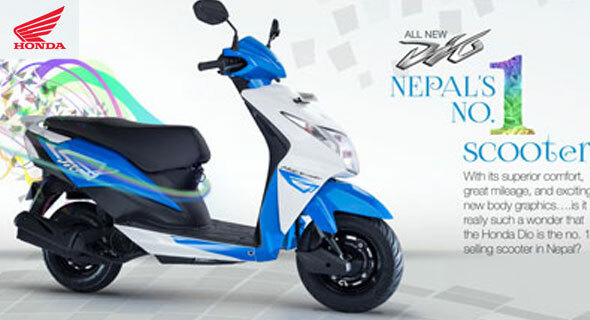 Honda Dio, a scooter that has become a symbol of style and utility, especially amongst the youngsters, is also the largest selling scooter of Nepal. STC believes that the availability of the new range of colors will not only add to the charm of the scooter but also provide its customers with added alternatives and a wider range to choose from. Besides an exciting look that should add to its dazzling personality, Honda Dio also promises to offer a perfect package of superior comfort and outstanding performance backed by Honda’s HET engine. Besides, it embodies the best of Honda’s technologies to deliver a perfect ride for its customers. Syakar Company, established in 1968, has been doing motorcycle business ever since its inception. It started its Honda automobile business in 2002. Today, it is one of the most reputed and leading companies of Nepal with its retail outlets spread all across the nation. © 2019 Syakar Trading Company. All Rights Reserved.